Paris, pour Etienne Groulleau, 1564. 12mo, ff. 52, A-F8 G4. Roman and Italic letter. T-p vignette showing a rondel with thistle and motto: “patere aut absinte – nul ne s’y frote”. 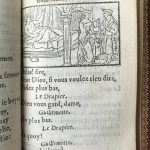 Seven woodcuts in the text. Light age yellowing and occasional waterstains. 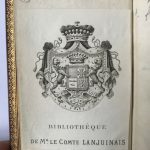 Private library bookplate (“Bibliothèque de M.r le Comte Lanjuinais”), most likely this book comes from the collection of the French politician and jurist Jean-Denis Lanjuinais (1753-1827). 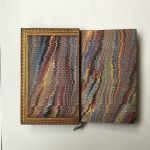 Rebound in a lovely C19th gilt-ruled red morocco binding by E. Niedret, gilt spine with title, green silk bookmark, inner dentelles, marble pastedowns, a.e.g.. A fine copy. The farce of Maîstre Pierre Pathelin has been printed several times during the first half of the sixteenth century. 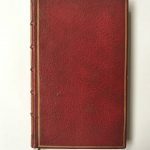 However, this lovely copy can be listed amongst the early editions of this fifteenth-century (1457) anonymous French medieval farce. It was extraordinarily popular in its day, and held an influence on popular theatre for over a century. Its echoes can be seen in the works of Rabelais. A number of phrases from the play became proverbs in French, and the phrase “Let us return to our muttons” (retournons à nos moutons) even became a common English calque. Tissier, Farces, No. 7; Du Veridier pp. 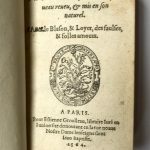 XX6v, p. 1080 [sic], Brunet vol. 4, pp. 435. Not in BM. 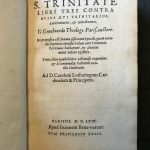 De Sancta Trinitate libri tres contra huius aeui trinitarios, antitrinitarios, & autotheanos. [with] Id., Ad Jacobum Schegkium, Schorndoffensem philosophum et medicum, assertionibus sacris de Deo sese temere immiscentem et tribus ipsius de sancta Trinitate libris, modo pro sabellianis, modo pro Trinitariis, inconstantissime obtrectantem, responsio. Paris, Apud Ioannem Bene-natum, 1569; Paris, Apud Aegidium Gorbinum, sub insigne Spei, è regione Collegij Cameracensis, 1575. FIRST EDITIONS. ã8 A-V8 X4 a8 b4 A-2B8, p. , 317, , 200. Two works in one volume. Italic, Greek, Roman letter, and a little Hebrew. Gracefully decorated initials and head-pieces. Light occasional dump staining of upper margins. In a very well-preserved De Thou calf binding, headcap of spine slightly worn, little worm track at lower corner of upper board. 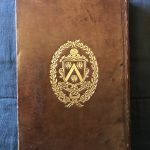 Covers embossed in gilt with the de Thou coat of arms. Modern label on flyleaf: “A choice example of the stately bindings executed for the great bibliophile, J. 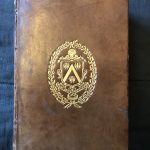 A. de Thou, before 1587, when he married his first wife, Marie Brabançon, after which event he added her arms on the covers of his books.”; spine with title blocked in gilt and the de Thou monogram in four compartments. Library stamp of the English book collector Richard Heber (1773-1833): “BIBLIOTHECA HEBERIANA”. Excellent condition. These first editions of two works of Gilbert Génébrard (1537-1597) discuss the Holy Trinity. 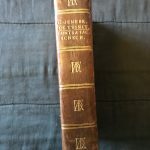 Genebrard was a Benedictine monk, “a zealous partisan of the league in France, and a writer for it, but also a learned writer in theology He studied at Paris, and having acquired a profound knowledge of Hebrew, was professor of that language at the royal college for thirteen years. He was twice named for episcopacy, yet never obtained it, and at last died in a kind of exile at his priory of Semur in Burgundy, in consequence of the violence of his writings against Henry VI. As a polemic as well as a politician, he was a most violent and abusive writer, but is said to have been more prudent in his conduct than in his style St. Francis de Sales gloried in having been his pupil”. 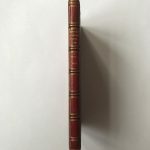 1812 Chalmers’ biography (vol.15 p. 398). With respect to the second work, which addresses Jacob Schegk (1511-87), who was a polymath German Aristotelian philosopher and academic physician, the scholar Christopher Burchill has defined the context of this work so: “as early as 1565, Schegk had supplied a metaphysical grounding for the disputed claims of Johann Brenz about the communication idiomatum, whereby the properties of the two natures of Christ were seen as interchangeable by virtue of the hypostatic union. The following year he undertook a more ambitious project of defending the doctrine of the Trinity along similar lines Far from exacerbating the conflict between reason and revelation, as was the case with the Paduan trained philosophers, according to Schegk a sound knowledge of Aristotle was a sure defense against the Arian challenge. As was to be expected, the appearance of this provoked a considerable reaction within the reformed camp. Still one of the leading apologists for the Palatine settlement, Thomas Erastus tried to get round the problem by suggesting that Schegk’s understanding of the hypostatic union in fact agreed with the reformed position and in no way justified the idea of a real communication of properties between the two natures. Yet the most searching criticism had been advanced by Simonius at the time when he was still working in Geneva. While he strongly defended the Metaphysics against the well-known criticism of Ramus, he added that this could only be brought into disrepute if applied to the discussion of theology, which was a branch of knowledge assessable only to faith. Moreover, Schegk’s interpretation of Aristotle could do no more than demonstrate the logical coherence of the trinitarian conception of God, but this was not the same as the essential Trinity as defined in the Creed. One of the Sorbonne theologians, Gilbert Generard, was later to extend this argument by accusing Schegk of maintaining the Sabellian heresy, the idea that the Trinity was an accidental from which did not reveal the full nature of God.” Aristotle and the Trinity: The Case of Johann Hasler in Strasbourg 1574-1575, in “Archiv fur Reformationsgeschichte”, 1988.